Make a list of every location or opening in your home that could allow wind into your home if broken. Draw a simple diagram (site map) of your home or business building layout. Openings you should include on the list are doors, windows, vents, and sky lights. Designate columns for width and height on the paper to help you keep track of proper measurements and dimensions. 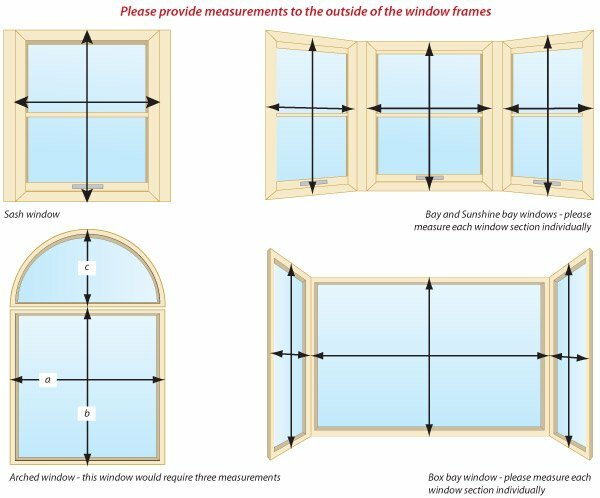 Measure your windows and doors from the outside. This method will provide you with accurate measurements since you need to protect the inside of your home from outside winds. Place the beginning of your tape measure on the outside of the window or door's rough opening. For example, if there is space between the window itself and the outside frame or exterior wall, include the length of the outside frame or exterior wall so you can cover the entire window opening area and not just the window itself. Stretch the tape measure across the width of the window or door to its opposite side to determine the correct length. Write the width of the opening into your notebook or paper under the appropriate column for that specific opening. * PLEASE NOTE * Width is always indicated 1st, and Height indicated 2nd. e.g. - 96 inches wide by 83 inches tall it should read 96 x 83. If required, repeat the measuring steps to determine the height of the same opening and write the measurement in the corresponding column for height to double check measurements. If you have windows that are not square or retangle please note that in quote order form. Now that you have measured your project, you're now ready to enter measurements. Above is our "Quick Quote" form. Please fill in project information and submit. Thats it! If you are ordering hurricane shutters from us online or would like us to export our products to you, please contact us to speak with one of our shutter specialist. We will help guide you through your project quickly and easily. Give us the go ahead on manufacturing your shutters for your project. Once you have received the requested quote from us, please verify all information is correct. Once you approve, you may respond to emailed quote or call 954.839.0037.